Join the Intrigue Summit in NYC on March 28-29, 2017! Salesgasm, which organizes world class conferences and expos across the globe focused on Sales and Marketing is all geared up to host the much awaited event of the year – “Intrigue Summit”. It is digital marketing buyers and suppliers rendezvous coming up in March 2017 and taking place in the world’s biggest urban playground – New York. The mission is to make a difference in the lives of digital marketers by creating an intriguing platform for education and high quality networking. After leaving its bold impressions through Out Of the Box Conferences in Singapore, Hong Kong and Sydney, Salesgasm is all set to woo the marketing professionals with some fantastic marketing techniques. The past events were loved and appreciated by everyone with a diverse range of expert ideas, valuable insights, some humorous anecdotes and plenty of tips being picked up and rolled into one brain. Few of the prime sponsors like Wobot, StudioNV and Webeasts are already onboard and many others are adding to this exclusive list. BlogsRelease, Research and Markets and Inspiration Unlimited eMagazine are few of the media partners of the event. Today, to magnetize people towards your product or service, digital mediums play an indispensable role. Sales professionals and marketers too are going tech-savvy just to attract a large chunk of the population. Keeping this in mind, the Intrigue Summit will be equipped with essential digital marketing knowledge delivered by leading decision makers such as Chief Executive Officer (CEO), Chief Marketing Officer (CMO), Senior marketing professionals, VP/MD/Director – Sales and Marketing, etc. Two days of power-packed innovative sessions, some serious networking and few of the most innovative digital marketing products and services on display from across the globe will bestow the attendees with an opportunity to learn like never before. Hear keynotes, presentations and deep dives from both local and international digital marketing experts like Rodnei Connolly (Executive Director, Worldwide Digital Marketing Leader - IBM); Michael Goldberg (Director, Global Marketing – Dun & Bradstreet); Irina Rivers (Director of Social Media – GroupM); Peyton Kay (Global Head, Marketing & Sales Enablement – MSCI) and many such experts. The speakers will be talking on interesting subjects like marketing automation, social media selling, powerful advertising techniques, content marketing, video marketing, mobile marketing and discussions on other trending topics. 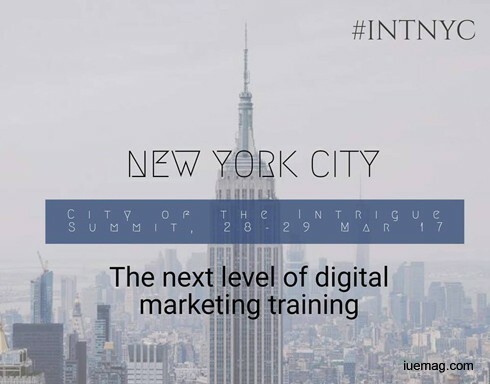 This sales and marketing event in New York will have over 400 - 500 digital marketing professionals from the US and the world who will share, network and inspire each other under one roof during the 2 days of the summit. The event aims to bring together sales and marketing decision makers from MNCs, SMEs and advanced stage startups under one roof. This enthralling conference with some of the most passionate digital marketing professionals will help bridge the gap between sales/marketing and IT with their fervor and enthusiasm. The iUeMagazine team is delighted to work with Intrigue Summit as Online Media Partners & is expected to bring Unlimited Inspiration for all readers from the proceedings of this event. Staying tuned to the enriching updates from this event is recommended.